At 09.30-10.00 depending on the arrival time of the participants drive to Ihlara Valley, created from the ashes of the volcanic Mt. Hasan. 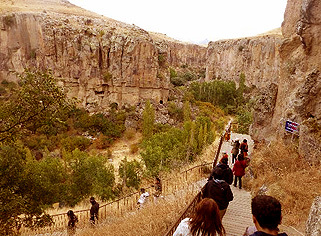 After hiking through the valley, which is watered with Melendiz River by Belisirma, proceed to Selime with hollowed out citadel and churches where fairy chimneys rest on the steep hillside. Stop at Yaprakhisar village to take photos. In the afternoon, visit to Derinkuyu Underground Village where dwellings with stables, cellars, storage rooms, refectories, churches and wineries were used as refuges for the Christian communities. you will be at the Istanbul Airport.